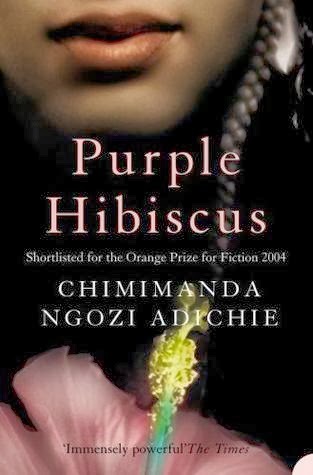 Purple Hibiscus is a hauntingly beautiful debut novel that explores the reach and limits and intersection of family, love, anger, and faith against the backdrop of civil unrest in Nigeria. Kambili, a fifteen-year-old girl, lives with her older brother, Jaja, and her parents in Nigeria. Her father, Eugene, is a religious zealot and wields tight control over his wife and children, subjecting them to severe physical punishment when they fail to live up to his impossible expectations, using his Catholic faith as a weapon against them. I cringed from some of the descriptions of physical abuse, but the spiritual and emotional abuse was constant and insidious, undermining the children's and his wife's sense of self and decimating their confidence. In addition, their family's wealth distances Kambili from the other children in her class and they see her shyness as snobbery. The real tragedy, very obvious to the reader but initially lost on Kambili herself, is Kambili's passive acceptance of her life, that "it was simply the way things were done" and there was no reason to try to understand it or wish it different. For example, on Sundays after attending mass, the family always visited the priest. One day, Kambili's pregnant mother was feeling nauseated and asked Papa if she could stay in the car while they visited. After silently intimidating Mama into coming in for the visit, he brutally beat her when they returned home, resulting in a miscarriage. When she came home after a short stay in the hospital, Papa insisted that the family "would recite sixteen different novenas. For Mama's forgiveness." Kambili concludes, "I did not think, I did not even think to think, what Mama needed to be forgiven for." To make matters more confusing for Kambili and Jaja, the people of the town praise Eugene for his courage in running a newspaper that speaks out against the tyrannical government. He pays the school fees for up to a hundred of the children in town. He shows remorse after the physical abuse, insisting he only does it because he wants what's best for them. Kambili yearns for his kindness and praise, though she fears his anger and disapproval. The world begins to open up just a little bit wider when Kambili's aunt - Papa's sister - comes to visit. Aunty Ifeoma is happy and joyful and completely different from Papa. Kambili isn't sure how to respond. "I did not know how to handle that kind of playfulness," Kambili explains. Aunty is Catholic as well, but unlike her brother, embraces her cultural traditions and supports her father, Papa-Nnukwu. Eugene refuses to see him because he is a "heathen" - he retains his traditional faith in their ancestors - though he agrees to send Kambili and Jaja for short 15-minute visits once or twice a year. Kambili studied Papa-Nnukwu during their short visit to his poor home, "I had examined him that day, too, looking away when his eyes met mine, for signs of difference, of Godlessness. I didn't see any, but I was sure they were there somewhere. They had to be." Then Aunty invites Kambili and Jaja to visit them, their first trip away from Papa and Mama. They were "bewildered that Aunty Ifeoma and her family prayed for, of all things, laughter." She tells them stories of their history, of the king of the Opobo people who stood up to the British, and declares, "Being defiant can be a good thing sometimes." Kambili notices that after his early-morning religious devotions to his ancestors, Papa-Nnukwu was smiling. She notes "I never smiled after we said the rosary back home. None of us did." One incident is pivotal symbolism. Kambili watches some boys playing games in a stadium, preparing for a local high-jump competition. The coach has the boys jump over the rod and then, when they aren't looking, raises the rod a notch and has them jump again. "He raised it a few more times before the boys caught on...He laughed and said he believed they could jump higher than they thought they could. And that they had just proved him right." It was what Aunty Ifeoma did to my cousins, I realized then, setting higher and higher jumps for them in the way she talked to them, in what she expected of them. She did it all the time believing they would scale the rod. And they did. It was different for Jaja and me. We did not scale the rod because we believed we could, we scaled it because we were terrified that we couldn't. This exposure to another way of living, one that involves laughter, joy, love and acceptance of others as predominant instead of fear, angry, and oppression, is life-changing for Kambili. She learns that faith doesn't have to be based on fear, that different doesn't mean bad, that public perceptions don't negate private actions. Adichie is a brilliant writer, evoking the confused emotions and contradictory thoughts of a young, abused girl, just starting to think for herself and slowly coming into her own. I can't wait to read more from Chimamanda Ngozi Adichie. Watch her TED talk: "The Danger of a Single Story." Seriously. Watch it. The novel is written with sensitivity and originality in wonderful prose. It depicts an unfamiliar culture while describing family values and the universal turmoil of teenagers. I would highly recommend it to book clubs.